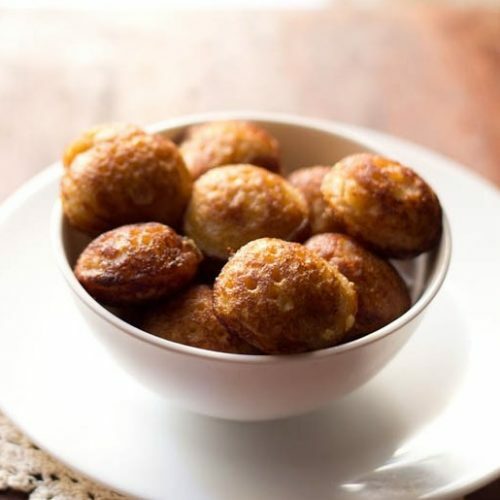 sweet paniyaram is a crisp, soft and porous dumpling made with leftover idli batter. vegan & gluten free snack. mix all the ingredients. heat the paniyaram pan. add a few drops of oil. now add the spoonful of the batter till 3/4th of the mould. cook the dumplings till they become golden brown from all sides. if not serving immediately, then keep the sweet paniyarams in a casserole, so that they remain warm and soft. the jaggery i use is organic jaggery powder and does not have impurities. if there are impurities then just melt the jaggery and filter it. once the mixture cools down, then add this to the idli batter.